Remember in last week’s outlook, I pointed out that “next week is going to be very interesting in the markets,” and that how I repeat this statement every week? Well, there’s no way I am going to deviate from that statement this time. Next week is unquestionably one of the most exciting times you will see in the markets. Okay, maybe not that exciting, but an important one nonetheless – particularly for the GBP/USD and pound crosses – as we will have the all-important UK parliamentary vote on the Brexit deal coming up. In addition, there will be two major central bank policy decisions and some important global economic macroeconomic pointers to look forward to in the second half of the week. With equities and cryptocurrencies imploding, volatility won’t be dying down any time soon. In fact, things could get really ugly, especially if UK’s dire political situation turns from bad to worse (for the lack of a better word). Undoubtedly, the GBP/USD and other pound crosses will garner most of the attention next week as the UK parliament votes on the Brexit Withdrawal Agreement on Tuesday evening. As I’m sure you are fully aware, the UK Government and the EU have agreed on the basis upon which Britain will leave the bloc in March next year. This has marked a significant step towards the UK’s objective of securing an orderly exit. But the Withdrawal Bill still needs to pass a parliamentary vote and there is a real danger that it could get blocked with many Brexiteers (and indeed remainers) clearly not happy about the terms of the deal especially on the Norther Ireland backstop arrangement. The UK Prime Minister Theresa May appears desperate to get MPs to vote for her withdrawal agreement, but she doesn’t seem to be winning their support. Indeed, not many MPs, including some of the PM’s own colleagues, believe in her claims that the alternative to this withdrawal agreement that she has negotiated with the EU is a no-deal Brexit. Many MPs are adamant that there are other alternatives available, including another referendum and negotiation of the current deal with the EU. According to domestic media reports on Friday, more cabinet resignations could be on the way if the Irish backstop is not amended. But time is running out and the sooner the UK sorts this mess out, the better it is for everyone involved. If the UK parliament chooses not to pass the bill, uncertainty will rise further and could lead to the resignation of Mrs May as UK PM. A snap election could then be called by the opposition Labour party. In short, so many things could go wrong. Investors and other market participants are in no mood to pre-empt the outcome of this vote, with the pound and the FTSE both receiving no love at the time of writing on Friday. Thus, I certainly do think that Tuesday will be a volatile day indeed. 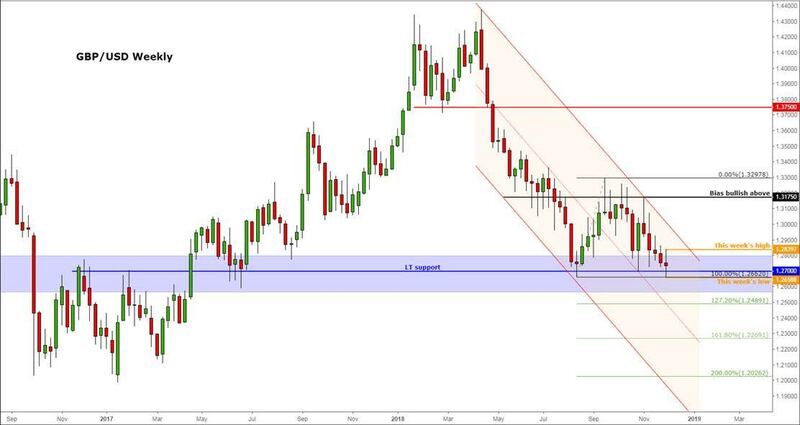 Sterling has been consolidating in narrowing ranges ahead of the vote, so it is ready to explode in one or the other direction depending on the outcome of the votes. Obviously, most people anticipate that the parliament will reject the vote, so it will be a real surprise and thus a bigger reaction if the deal unexpectedly passes through. In this potential case, the pound could absolutely skyrocket on the back of what would be a soft Brexit deal. However, if it fails to pass through then we could see the end of Theresa May as UK Prime Minister, and potentially another couple of hundred pip drop in the pound. Before Tuesday’s UK parliamentary votes, the market will have had important data from the world’s second largest economy to consider. Chinese trade and CPI inflation figures will be released over the weekend. Let’s see whether and how US tariffs have impacted China’s exports. If the data shows a large drop in exports to the US, then this could potentially be bearish for the likes of the Aussie and Kiwi, and potentially weigh further on stocks at the Asian open. Meanwhile from the UK, we have a bit of data dump on Monday as the ONS publishes that latest estimates for GDP (monthly), construction output and manufacturing PMI, among other things. In fact, more UK data will follow on Tuesday, this time it will be earnings and jobless claims figures. BUT make no mistake about it, none of these figures will matter that much in the grand scheme of things as the focus will be on Brexit on Tuesday – more on this above. On Wednesday, meanwhile, we will have the Federal Reserve Chairman Jerome Powell testifying on the economic outlook before the Joint Economic Committee of Congress. Also on Wednesday, we will have the last US Consumer Price Index (CPI) report before the Fed’s December rate decision next week. Powell’s testimony and US CPI are both unlikely to dent rate hike expectations for December, but could potentially have repercussions for Q1 rate hike probabilities. Thursday is a big central bank day as both the Swiss Nation Bank and European Central Bank will decide on monetary policy. The ECB is set to end QE and might provide a more optimistic forecast if UK parliament has passed the Brexit deal by then, else Mario Draghi may sound a bit more dovish at his press conference especially in light of recent falls in oil prices and EM currency crisis hitting demand. And Friday will see the release of a few important macro pointers from around the world; these include: Chinese industrial production, Eurozone manufacturing and services PMIs, and US retail sales.